30 days for a full refund. If you are having trouble at any time, please refer to our help files, or feel free to contact us. Beautiful musical arrangements of some of your favorite verses captured in song, for the reflection and meditation of God's Word. Scripture in song - Inspirational Christian devotions from the Bible. 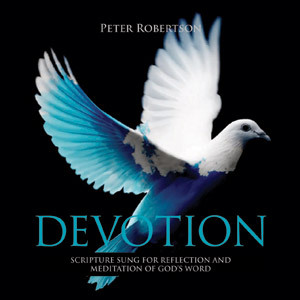 This is a highly recommended album by Peter Robertson - an anointed musician from Australia who does all of the guitar work for The Secret Place albums. “Devotion” maintains the same beautiful instrumental backing we are used to in Peter’s purely instrumental albums, but this time with the addition of gentle vocals singing portions of scripture to help us meditate on God’s Word while we rest in His presence. Click Add to Cart on the item you wish to purchase. It will be added to your shopping cart. Your order will be processed securely through 2CO. Please provide correct billing address and email to ensure proper processing. You may change or cancel your order at any time. If you are downloading, you must click on the final link to receive your downloads. Looking for a little inspiration for your daily Bible devotions? This full-length album contains 8 songs fully based in scriptures - perfect devotional music for your time alone with God. The Bible says that the word of God is living and active. It has the answer to every need in your life. Music is an incredible vehicle to help plant things in your heart, and singing scripture is a biblical principle. When the Jews meditate on the word of God they often sing portions of scripture. "Beautiful musical arrangements of some of your favorite verses captured in song." These short devotions in song have been especially written to help you focus on God’s Word when faced with the daily trials of life. All the lyrics in these songs come directly from the Bible so when you sing these songs you are singing the scriptures. Listening to these songs makes for a great daily devotion or as an aid for meditating on the Word of God, or memorising scripture. Let scripture become implanted in your heart as you allow these inspirational devotions to wash over you, refresh you, and offer you comfort and hope. Experience the refreshing sound of acoustic guitar in these instrumental music cds. Let the soft easy listening instrumental cds develop a calm and relaxing atmosphere.